And I mean that as a compliment. We’ve seen this trait throughout Branson’s well-documented adventures—from attempting to hot-air balloon around the world to kitesurfing the English Channel to raising baby lemurs on his own private island. But also in his myriad businesses. Virgin Records created music-listening outposts where customers actually wanted to shop. 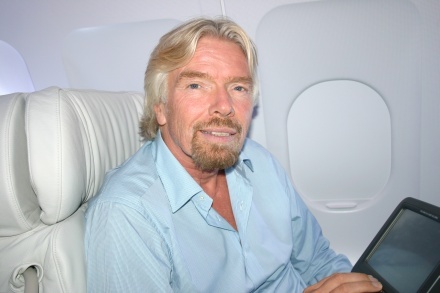 After a lousy flying experience stateside, Branson decided to start his own upstart airline, Virgin America. And with Virgin Galactic, he plans to send the masses to space. More simply put, Branson has been “disrupting” long before the term became a business buzzword. So it’s not surprising that one of Virgin’s newest ventures is Virgin Disruptors, an online media property and event series that celebrates swimming upstream in business and beyond. I recently sat down with Branson, following a Virgin Disruptors roundtable in San Francisco, for a chat about identifying big ideas, what it takes to see them through, and how it feels to crowd surf in your 60s. The theme of today’s event was disruption, which has become a much bandied-about term these days. But if you look at your career, all the way back to Student magazine, your very first venture in high school, and Virgin Records, you’ve been disrupting for a generation. What does the word “disrupt” mean to you? Obviously, you disrupt to improve. And sometimes, if you don’t disrupt, you don’t exist. With Virgin America, for example, there’s a rule that says foreign companies can’t exist in the U.S. airline business, so we had to come up with a campaign and disruptive ideas to get our airline accepted—I think, ultimately, to the benefit of the traveling public. In the mobile-phone business, we had to change the laws in England in order to enable us to piggyback on other networks, to create competition and introduce the prepaid idea. As a result, it’s now gone global and we’re setting it up in every South American country, also to the benefit of the public. To bring extra competition, sometimes you have to be imaginative. Over the years, you haven’t necessarily invented industries, but reinvented them. In business, is it more important to do it first—or do it better? Obviously, it’s good to be first and the best. But, ultimately, I think the best normally wins. There have been quite a few examples in the Internet world where the first company didn’t survive, but somebody came in and did it better. So, yeah, I think it’s about doing it best. You’ve had plenty of “disruptive” ideas over the years. Some, of course, haven’t panned out—Virgin Cola being one of the more notable examples. As an entrepreneur, when is the time to pull the plug on an idea that isn’t working? Slightly sooner than I’ve done in the past. [Laughs.] It can be quite expensive to pull a struggling company up with one of your other companies and cling on too long. So once the writing is looking like it’s on the wall—it’s beginning to cost you money—it’s better to really cut your losses and use that money to start something new. I was flying on Virgin America with you a couple years ago, and a passenger asked a flight attendant to hand you his business plan. You’re constantly being pitched and there are a lot of good ideas out there. What separates a good idea from a good business? A good idea doesn’t have to be a good business. I think the important thing in life is, do you want to spend time on an idea that may just make a difference to other people’s lives, but may not make you lots of money? Or do you want to spend your life, your time, on something that’s going to make you lots of money and might also make a difference in other people’s lives? But a good business idea most likely has to improve other people’s lives dramatically for the better. It most certainly has to be an innovative idea, one that hasn’t necessarily been done by other people. And if that’s the case, then you should just give it a go. Who are some of the disruptors on your radar? Well, some of them are sitting in this room. You’ve got Nest, you’ve got Google. I mean, what Nest is doing could reduce global warming by 10 percent. That’s the effect their products could have. Google, with their driverless cars, could save hundreds of thousands of lives. And that’s just one of the numerous, incredible ideas that they’ve come up with. But there are tons of small companies coming out with disruptive ideas as well. In some ways, do you think it’s gotten too easy to innovate? That, because it’s so easy to start a business now, there are a lot of bad ideas out there too? How do you stand out from the crowd? It can never get too easy to innovate. And it’s great that there are just thousands of people trying things, and then, if they don’t succeed, they’re learning—it’s the best education they could have. Learning how to fail is ultimately the way you learn to succeed. Finally, switching gears. I thought you had literally done it all—from crossing the Atlantic in a speedboat to crossing the Pacific in a hot air balloon. But I just heard that during a recent Virgin America event in Dallas, you went crowd surfing for the first time. How was it? Well, let’s just say being lifted up on the shoulders of a hundred women is great fun. Who is Afraid of General Muhammadu Buhari? Application For The 2014 Hansen Summer Institute on Leadership for Students Worldwide Is On!